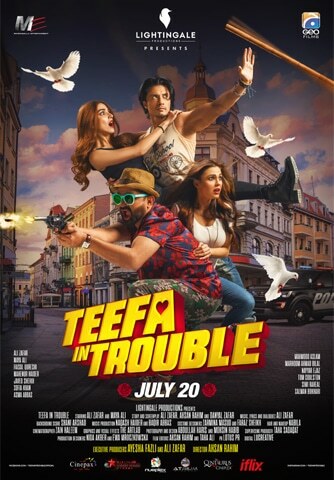 Teefa in Trouble has now been playing at cinemas for 10 days, so I may not have to explain what the movie is all about. 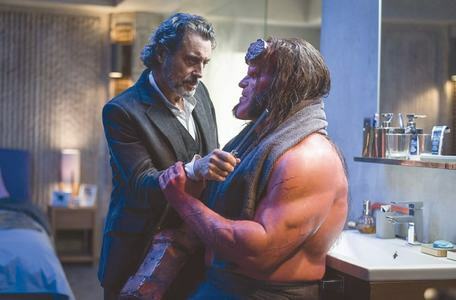 However, for those who have yet to see it, here’s the nutshell version: Teefa (Ali Zafar), a local hood-for-hire with a heart of gold, has to abduct a rich man’s daughter because she was promised to be betrothed to the son of Teefa’s usual client. Teefa travels to Poland, whisks the girl away, crashing police cars, fighting security guards and goons inside train cabins, sings a few romantic songs and ultimately wins her affections. Figuring the movie out hardly expends brain cells. In fact, what I’ve described is actually the trailer, which is more or less the movie in its entirety. Ali Zafar, who co-writes, produces, gives the music and acts, has been very clear on the type of cinema he wanted to make from day one: a light-but-not-lightweight Bollywood-inspired entertainer throbbing with Pakistani DNA. By now, again, I don’t need to tell you that Teefa is already a box-office smash, irrespective of naysaying speculations and controversies. Teefa isn’t perfect, nor does it want to be. Sometimes being good enough is actually good enough (if only more people understood the importance and rationale of this argument). 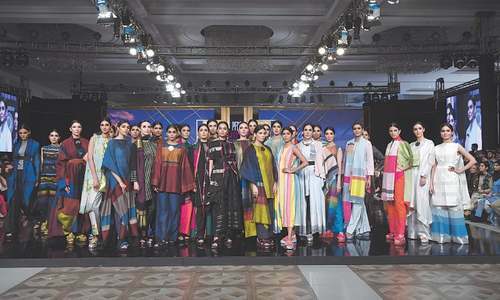 Zafar and co-writers Danyal Zafar and Ahsan Rahim (the latter, also the director) barricade themselves within an unyielding set of rules. Their intent is to make a hip, nimble, unexacting action comedy that highlights their good side for their Pakistani debut. After all, even big stars such as Zafar and Rahim (noted for his zany Ufone commercials) need star-making vehicles. Teefa’s screenplay is aware of the plot’s shortcomings. At times I could feel that a scene here and a scene there were snipped off in the edit (the intermission break, in particular, doesn’t land on a grand, oomph moment). 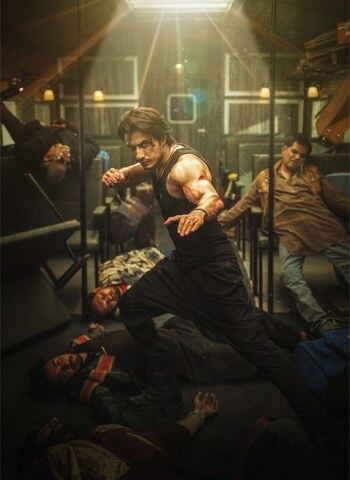 The flow, regardless, is silky smooth as Teefa, the character, navigates through the story’s emotional and comedic turns with the dexterity of an Olympic-level ice skater who is itching to attempt a near-difficult triple axel (case in point: an enjoyable fantasy-skirmish between Teefa’s inner selves that tries to add a new spin on a man’s emotional conflict). Teefa, a daredevil with his bamboo-wielding and parkour skills, is written as a loveable ruffian whose visual unseemliness feels like a harsh contrast to who he is underneath. His core is quite a bit softer, especially when he is with his widowed mum (Seemi Raheel) for whom he wants a marginally better life. In his first scene with his mum, Teefa gets her a new TV set because the old one had been on the blink for weeks. Despite being a ruffian, he doesn’t loot an appliance store. He just threatens a villain (Nayyer Ejaz) for the money owed to his client (Mehmood Aslam), earning him 20,000 rupees that buys him the TV. This one moment is enough to describe Teefa: he isn’t ambitious or greedy, doesn’t want a majestic mansion nor a Mercedes or a sizable bank account. He’s happy doing a steady series of odd-jobs menacing people to pay up their dues, until he is able to open his food shop, ‘Teefa Kay Tikkay’. The shop’s title isn’t the only pun in Teefa; the movie is swamped in pun-tastic wordplay. Every scene has one thandi [flat] punchline with a response that is either improvisational, gives way to witty-wordplay or is just plain silly. Most jokes are duds that fall flat on their faces — and both Zafar and Rahim know that. They just run with the washouts, suggesting that the audience (or the character to whom Teefa is talking with) haven’t heard their response. This idiosyncratic style is a part of Teefa’s tone — yes, the hard-to-define and harder-to-master gist of storytelling you’ve been reading about in most of my reviews in Icon. Both Zafar and Rahim, miraculously have a natural knack for nailing this elusive filmmaking constituent. While Zafar, Rahim, Faisal Qureshi (an old compatriot of the duo) and Javed Sheikh are excellent, I found Maya Ali to be barely adequate as the film’s leading lady. Ali plays Anya, the wild-child daughter of a rich man (Jawed Sheikh) who sets the plot on its whirlwind trajectory. Even when the movie tells the audience her backstory, we don’t really connect with her sorrows, nor do we get swept up in the leading pair’s romance. It’s a slight hiccup really, in a movie teeming with hummable songs, adequate cinematography (Zain Haleem’s camerawork suits the action-comedy timing of the shots, without indulging in technical theatrics), snappy, perfectly snipped edits, and near-perfect storytelling skills. At times, a movie that doesn’t aim that high yet scores on all levels is good enough.